Igi 1 trainer is the software which freezes the health of the player and it also freezes amino and never ends bullets, the result of freezing health and amino, there is no effect on the player when an enemy shoots the player and you can shoot an unlimited bullet without any tension. inside the trainer, the software contains nothing you need to do, direct open igi 1 trainer.exe and left as it is. these all keys of pc keyboard helps you for getting anything as per your choice. you need to just press one time while playing the game and after all things done. you can play IGI 1 game without worry about health and Gun bullet. F9 —– it is the button of the keyboard when you press this button, the health of the player will get freezes and never you will die. F11 —- it is the button of the keyboard when you press this button. you can shoot by gun unlimited without reloading bullet. F12 —- it is the button of the keyboard when you pressing this button, all things are back to the normal inside the game. 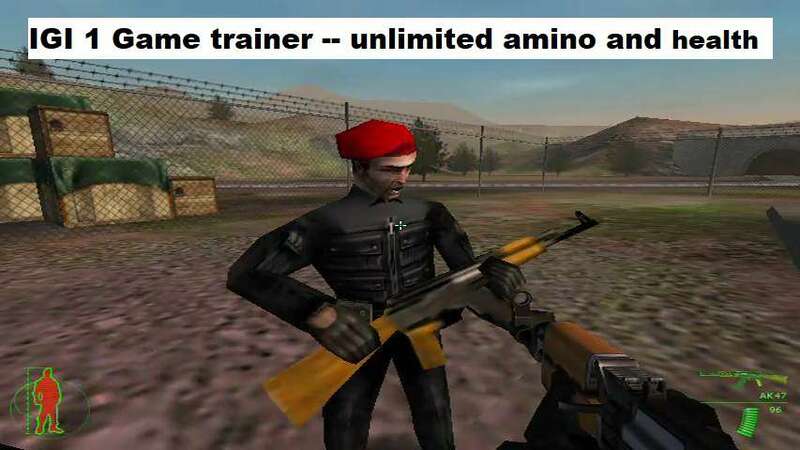 In order to get unlimited ammo and unlimited health you need to download IGI 1 trainer software and after downloading no need to install, direct open IGi 1 trainer. Now directly open IGI 1 trainer. Now start IGI 1 Game in laptop or desktop. if you want to get unlimited health then you need to press F9 button on the keyboard. Now if you want to get unlimited amino, just press F10 button on the keyboard while playing IGI 1 game. Now just see in your game, the health, and ammo where freezes like cold ice. Most of the gamer says some missions of IGI 1 game is the little bit harder, so the advantage of using trainer is you can complete any mission without any fear from the enemy. Q .what is the size of the IGI1 trainer software? Q. it will work on my laptop or on my computer? Ans – yes, this trainer works. Q. we need to put trainer setup inside the IGI 1 Main folder? Ans – no, you need to just open that trainer from anywhere, it is not compulsory that you have to put in the main folder of igi 1 game. Q. this trainer is working on IGI 2 game while playing IGI 2 game? ns – no, this trainer only works on igi 1 game.